Arachnoiditis ossificans (AO) is a rare type of chronic arachnoiditis characterized by ossification or calcification of arachnoids usually causing progressive neuropathy. It is usually a consequence to adhesive arachnoiditis. Most of the patients have the history of previous invasive intervention, trauma, infection, subdural hemorrhage, or myelography. Thoracolumbar region is mostly affected by AO. We present a case of AO in a 32-year-old female who presented with an intradural extramedullary space-occupying lesion. A 32-year-old female patient presented with a long-standing history of low back pain which was radiating to the right lower limb with numbness and urinary incontinence for the past 7 years. In 2009, it had been diagnosed as spinal tumor in a private hospital on the basis of magnetic resonance imaging (MRI) of the spine which revealed decreased anteroposterior dimensions of the dorsolumbar spine with mild evidence of dural ectasia and an intradural extramedullary lesion at D12-L1 measuring 8.7 cm × 1.9 cm × 3.4 cm, for which surgery was advised. However, the patient refused surgical intervention. Now, she presented in orthopedics outpatient clinic with left-sided paraparesis, retention of urine along with leakage of urine from lower abdominal scar for 2 months. The back pain had gradually increased in intensity. On examination, she had decreased power in the lower limbs which was more on the left side. Sensations were decreased in L5-S1 dermatome. X-ray spine showed kyphoscoliotic deformity of the lumbar spinal column with increased lumbar lordosis and mild posterior scalloping at D12 and L1. There was no obvious canal stenosis. Contrast-enhanced MRI of the lumbosacral spine revealed an abnormal, elongated intradural soft-tissue signal intensity with thin peripheral enhancement of size 7.5 cm × 3.8 cm × 2 cm at D12–L1 associated with widening of conus medullaris and marked scalloping of posterior aspect of D12–L1 vertebral bodies. An impression of large intradural extramedullary neoplastic space-occupying lesion was offered [Figure 1]. D12–L2 laminectomy with tumor excision was planned. Intraoperatively, the arachnoid was inflamed and thickened along with a lesion containing whitish pus-like material. Nerve roots were traversing through the lesion. The whitish fluid was aspirated and biopsy was taken. Culture of the fluid was sterile and negative for acid–fast bacilli. 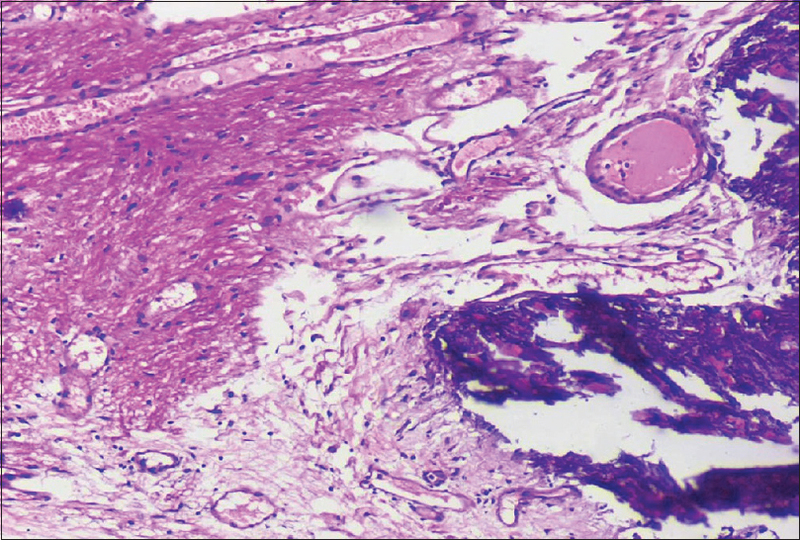 On histopathological examination, meningeal tissue and thick nerve bundles along with calcification were noted and a diagnosis of AO was made on the basis of extensive calcification. No cyst was identified microscopically [Figure 2] and [Figure 3]. The patient is on follow-up for the past 1 year and has no neurological signs or symptom. The term “AO” was first used by Gatzke et al. in 1957. Small asymptomatic calcified plaques of arachnoid are frequently encountered in autopsy which are considered as benign. However, calcification with extensive involvement of meninges along with neurological symptoms is very rare with only <80 cases reported till date in literature. In our case, the situation was further complicated as the lesion was mimicking tumor clinically. According to a review report of Kitagawa et al., the thoracic spine is the most common site (66%), followed by lumbar (24%) and cervical spine is rarely involved. The patients usually have a history of any surgery, trauma, infection, contrast imaging, subarachnoid hemorrhage, or any vascular anomaly. Only two cases are reported in literature with total absence of any of the above causative factor. The exact mechanism of AO is not known. Various mechanisms have been proposed for the development of the ossification including intradural hematoma, which organizes and ossifies, seeded bone fragments, and osseous metaplasia associated with chronic inflammation. Kaufman and Dunsmore found chronic fibroblastic proliferative changes in leptomeninges associated with the osseous metaplasia in all the cases they reviewed. However, a high prevalence of vascular abnormalities of the spinal cord was also seen in their series. They also suggested that vascular shunting or pressure effects might contribute to the development of the disorder, possibly complicated by bleeding into the abnormal tissues. No associated vascular anomalies were detected in the present case. With the advent of MRI and computed tomography (CT), it is easy to diagnose this entity in most of the cases. In our case, unfortunately, CT scan was not performed and the lesion was missed. It was the histology that confirmed the diagnosis. Complications such as syringomyelia and arachnoid cyst have been reported following AO. The best treatment strategy for AO has not been established. In patients with severe or deteriorating symptoms, surgery is often performed. Procedures including decompressive laminectomies, anterior fusion, and foraminotomies are preferable and good results have been reported. The surgical option often presents a clinical dilemma, as surgery itself is a known causative factor in AO. Domenicucci et al. formulated a classification based on radiological features to assess treatment options and compared their postoperative outcomes. Type I is described as a semicircular pattern that involves a portion of the thecal sac and was found primarily in thoracic spine, Type II is described as a circular pattern that involves circumference of the thecal sac and was found in either thoracic or lumbar spine with thoracic being more common, and Type III is described as ossification that involves whole of the thecal sac contents and was found exclusively in the lumbar region. Based on this system, Type I and II patterns were more likely to proceed for surgical interventions, which generally consist of decompressive laminectomy, while Type III are managed medically. However, only half of the patients treated with surgery show improvement, whereas those with only ossification show satisfactory outcomes with medical management. Therefore, in patients with only mild symptoms, conservative management is usually been adopted. AO is an uncommon disorder which presents with a wide range of symptoms and mimics a neoplastic lesion. The identification of this entity has treatment implications. It can be suspected by taking detailed clinical history and imaging. 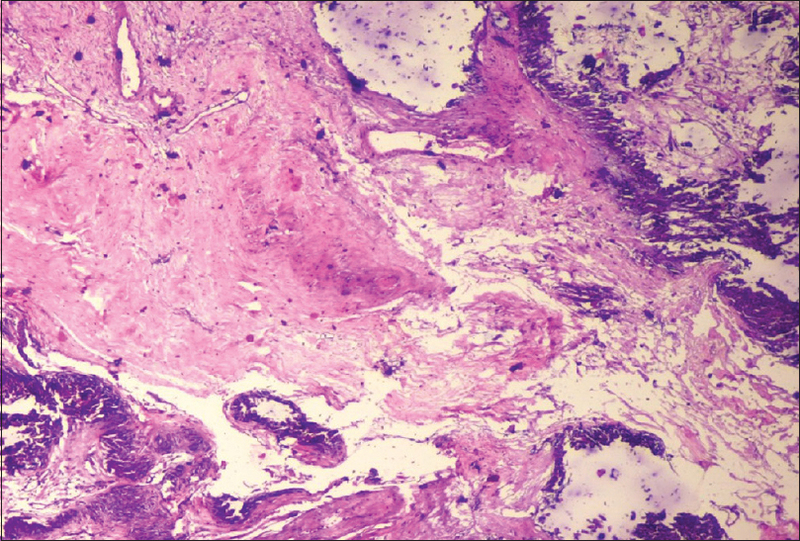 However, for a definitive diagnosis, histopathology is the gold standard. Liu LD, Zhao S, Liu WG, Zhang SK. Arachnoiditis ossificans after spinal surgery. Orthopedics 2015;38:e437-42. Maulucci CM, Ghobrial GM, Oppenlander ME, Flanders AE, Vaccaro AR, Harrop JS, et al. Arachnoiditis ossificans: Clinical series and review of the literature. Clin Neurol Neurosurg 2014;124:16-20. Gatzke LD, Dodge HW Jr., Dockerty MB. Arachnoiditis ossificans; report of two cases. Proc Staff Meet Mayo Clin 1957;32:698-704. Herren RY. 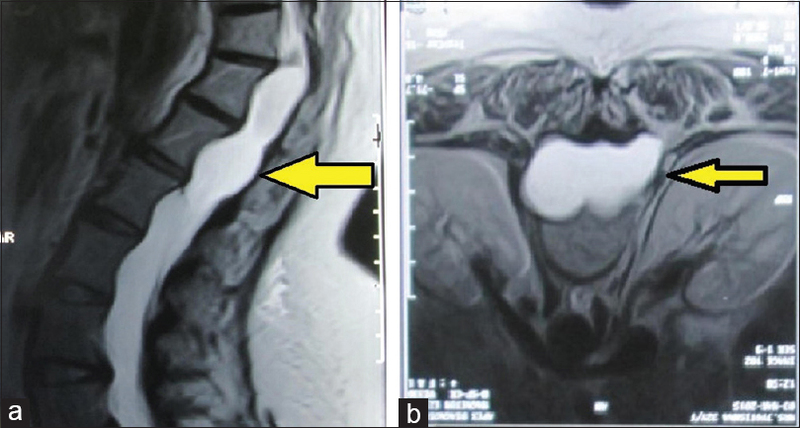 Occurrence and distribution of calcified plaques in the spinal arachnoid in man. Arch Neurol Psychiatry (Chicago) 1939;41:1180-6. Kitagawa H, Kanamori M, Tatezaki S, Itoh T, Tsuji H. Multiple spinal ossified arachnoiditis. A case report. Spine (Phila Pa 1976) 1990;15:1236-8. Nagpal RD, Gokhale SD, Parikh VR. Ossification of spinal arachnoid with unrelated syringomyelia. Case report. J Neurosurg 1975;42:222-5. Kaufman AB, Dunsmore RH. Clinicopathological considerations in spinal meningeal calcification and ossification. Neurology 1971;21:1243-8. Frizzell B, Kaplan P, Dussault R, Sevick R. Arachnoiditis ossificans: MR imaging features in five patients. AJR Am J Roentgenol 2001;177:461-4. Domenicucci M, Ramieri A, Passacantilli E, Russo N, Trasimeni G, Delfini R, et al. Spinal arachnoiditis ossificans: Report of three cases. Neurosurgery 2004;55:985.